Big news today on several fronts: against the overuse of antibiotics in agriculture and for healthier food for school children. The Chicago Public Schools announced that its main food-service company, Chartwells-Thompson Hospitality, will begin buying and serving chicken drumsticks from birds raised in the local area without antibiotics. The deal will bring 1.2 million pounds of chicken to 473 schools per year, and represents about 25 percent of all the chicken that Chartwells-Thompson serves in the school system. The new move was announced in a media telephone briefing that was hosted by the Pew Charitable Trusts’ Campaign on Human Health and Industrial Farming and included representatives from Chartswell-Thompson; the nonprofit organizations School Foods Focus and the Healthy Schools Campaign; Whole Foods Market, which is making it affordable to transport the birds; and Miller Amish Country Poultry, the supplier. It makes Chicago, which is the third-largest school district in the country, the largest district to endorse feeding kids chicken that is “ABF” or antibiotic-free. That means the birds were raised without routine use of small doses of antibiotics in their feed, a strategem that makes it possible for them to survive in the crowded conditions of chicken batteries but that breeds vast amounts of highly antibiotic-resistant bacteria as a consequence. It puts economic force behind the movement to drag very large-scale agriculture away from antibiotic use. There has never been any scientific debate about the way that antibiotic overuse on farms increases the presence of resistant bacteria in the environment (for evidence, see this decades-long bibliography). It’s always been a question of politics and economics — and until recently, the economics have been on the side of the antibiotic-using producers. An investment like this could begin to tip the scale in the other direction. It also brings real food back into schools: This chicken will be cooked in the schools themselves. Preparing raw chicken in school kitchens, which until recently might have lacked real ovens or trained cooks, is a significant step — but it also promises a huge improvement in kids’ nutrition during the day over the pre-formed nuggets and patties they would otherwise get. The deal will provide enough ABF chicken to make lunch for 305,000 kids two to three times a month, said Bob Bloomer, Chartswell-Thompson’s regional vice-president. He indicated that they would like to serve more, but that demand for ABF chicken is so high that they can’t buy enough. Interestingly, it also puts the Chicago school district in line with another important constituency in the same city: hospitals. In 2010, 300 hospitals there announced they would begin serving meat raised without the use of antibiotics to cancer patients and others they felt would be at special risk from resistant bacteria. There’s another reason why today’s announcement is so important: It represents a counter to two discouraging new pieces of news regarding use of agricultural antibiotics. First, the Food and Drug Administration in September released the latest full report from the National Antimicrobial Resistance Monitoring System (NARMS), a federal project that tracks drug-resistant bacteria in food, humans and live food animals. It shows that in the latest year for which there is data, 2009, antibiotic resistant bacteria are becoming more common on retail meat, especially chicken breasts. 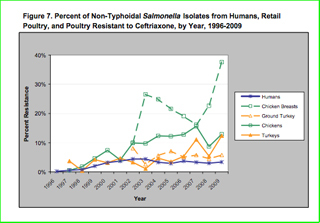 For one example, look at this table, which shows results over time for Salmonella that is resistant to a key drug, ceftriaxone. The line on the far right that is soaring out of sight represents chicken breasts. So, to sum up: Antibiotic use in farming is rising, and the occurrence of antibiotic-resistant bacteria on farms and in meat is rising as well. In that context, the Chicago schools’ announcement of their willingness to buy antibiotic-free meat isn’t just newsworthy; it’s a major step in protecting their students, students’ families, and the rest of society as well. Update: Well, this is odd. Between Saturday, when I downloaded the FDA report, and today (Tuesday), the report was updated and the amounts in several drug categories were changed. The updated numbers for 2010 are corrected above. Is China Banning Growth Promoters And Do They Mean It?